Described as a maritime adventure I will admit my expectations were not high. With a beautiful cover and the mention of pirates, voyages and adventure I plonked this onto the pile of books beside my bed - where it sat for a few weeks. The author of this book had spoken at a meeting I attended, and I was intrigued more by his professional life then this book, but with the promise of adventure and that pretty cover (yes - I know), I flipped it open one night before sleeping and fell headlong into it. The main character, Annie Tidechild (orphaned and living in a library), isn't like most characters I encounter in children's books. She has fire in her belly (and fiery hair), and isn't shy of fighting. The first chapter involves attacks and explosions and not long after another character (Duck) finds himself in a weaponry room (which bought Chevhov's gun to mind - if there's a room full of weapons in the beginning of the story, will there be a mighty fight later on?). Rich language through out the book reminds me of far older books I read growing up, and mischievous pilfering of a wine bottle made me look more closely at this book. I can see links and influences to classic children's books (with 2015 being the 150th anniversary of Alice in Wonderland, I think comparisons between the two will arise or even C.S. Lewis' Narnia books), but like the teacher's notes state it's Philip Pullman's Lyra Belacqua I'm reminded of. Could you imagine writing a children's book and then being compared to Philip Pullman?! Amazing. And while I can't remember where I read it, I am sure this is meant to be a trilogy. But, maybe it's just Star Wars being on at the moment, the mentions and references to Anni's father Sunsword Tidechild and her pirating mother and uncle make me think there's room for prequels here. I suspect this was not a book written purely for children originally, and this reason alone makes it rich and intriguing. With the Christmas and gift giving season now behind us, I gifted this book to a couple of people, and they ranged between 10-40 years old. I'd recommend this book to confident year 4 readers onwards (especially girls), but would encourage adults to have a flick too. And if you are a teacher of years 5 & 6, the themes of this story fit nicely with the new history syllabus (in Australia). Here's hoping Chris Richardson writes fast and completes series quicker then Isobelle Carmody. I don't think I could wait that long for the rest of the series. 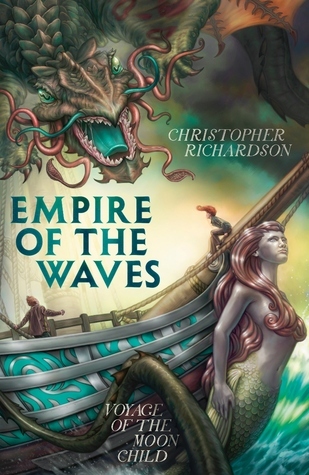 0.8% "I was lucky enough to hear Christopher Richardson speak last week and was so impressed with his talk I dashed home with this children's book. Really need to settle down with some free time to finish reading everything I've started. Expecting big things from this wee book though." 47.61% "The green eyed, red headed daughter of a librarian, Annie Tidechild (heroine) has captured my heart."